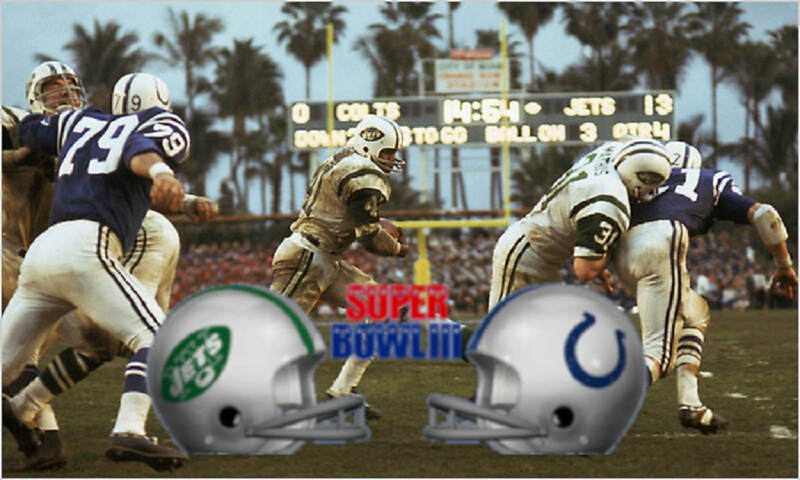 The Baltimore Colts would represent the NFL against the Jets. They boasted a 13-1 regular season record and had destroyed the Cleveland Browns, 34-0, in the NFL championship game. To say they were heavily favoured would be an understatement. In real and physical terms, the bruising running of the Jets' running back tandem of Emerson Boozer and Matt Snell wore down a bemused Colts defense, while the Jets defense, in particular, former Colt cornerback, Johnny Sample, played an inspired game. However, in an era when quarterbacks still called their own plays, the game that Joe Namath called for the Jets is what really earned him the MVP award. With everyone expecting "Broadway Joe" to throw, throw, and then throw some more, he made his arm a limited part of the gameplan, forcing the Colts to adjust, which they ultimately failed to do. 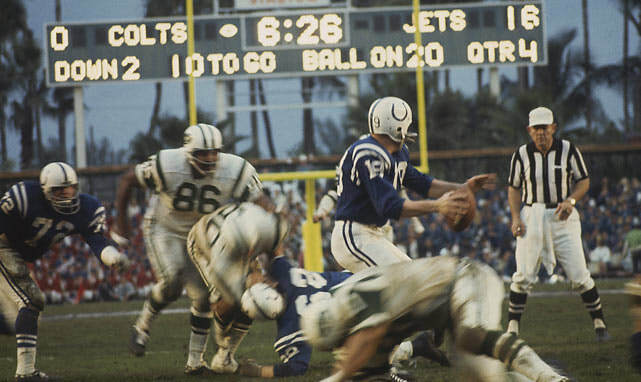 After the steady back-and-forth of the opening quarter, Colts turnovers would give the Jets increasingly good field position, which Matt Snell eventually converted into a 4-yard touchdown run and a first half 7-0 lead for the New York Jets. 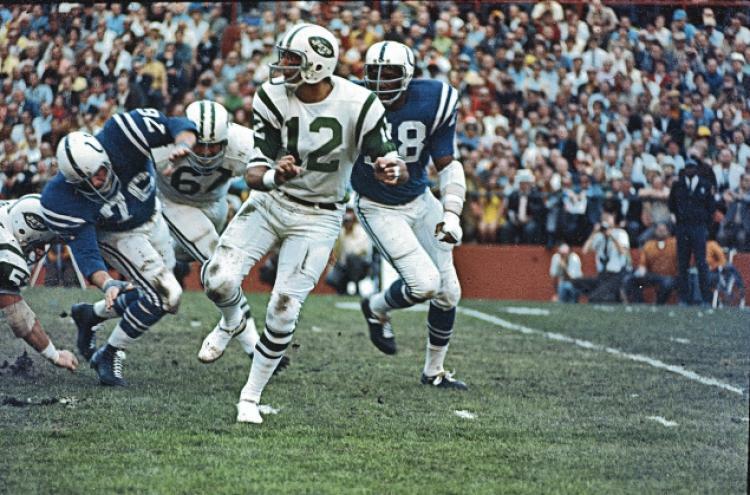 Namath would lead three more scoring drives, each ending in field goals, giving the Jets a commanding 16-0 lead over the Baltimore Colts before they finally pulled their starting quarterback, Earl Morrall, and inserted injured veteran, Johnny Unitas. 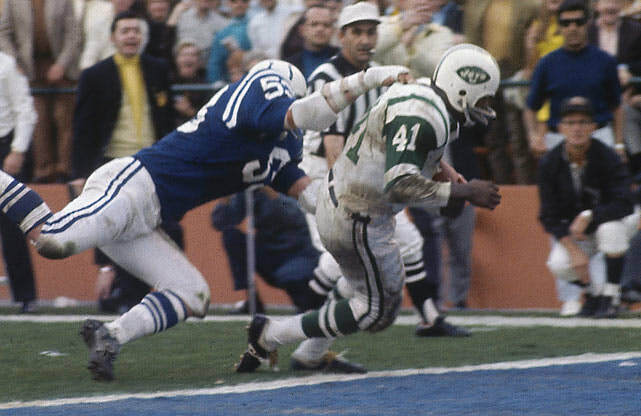 Although Unitas would lead the Colts on a late scoring drive, it was too little, too late, as the Jets had pulled off the upset almost nobody though possible, and were victors, 16-7. New York Jets' running back, Matt Snell, rushed for 121 yards on 30 carries and scored the game's only touchdown. 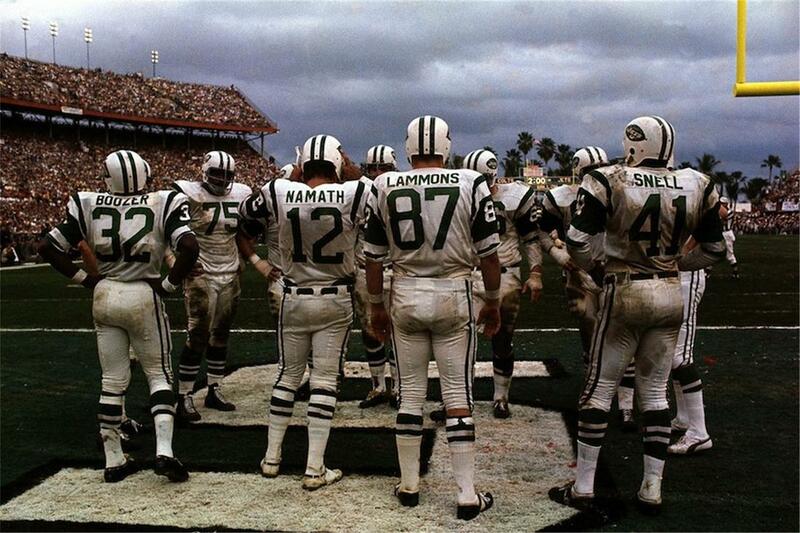 Jets' quarterback, Joe Namath, huddles up with his team. On this particular afternoon, it was his game-calling that earned him the MVP award. National Anthem: Llyod Geisler and the Washington National Symphony Orchestra. Halftime Show: Florida A&M Marching Band. So heavily favoured were the Baltimore Colts, that for some bizarre conspiracy theories swirled that the game had been fixed (although there was no evidence of this). Perhaps the most prominent and outspoken player on such theories was the Colts' Bubba Smith - you can check out the videos below that features Smith speaking as well as a breakdown of these theories. And you can read a little more about them here. 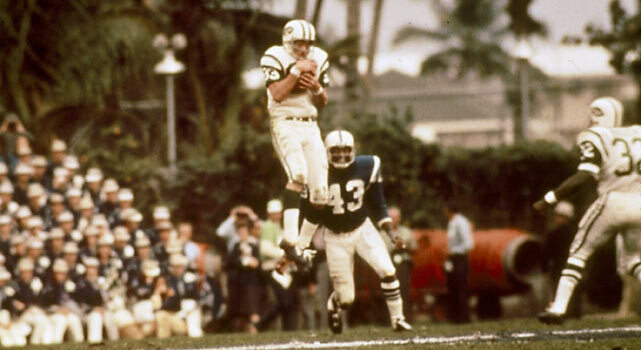 While much is made of the how big a favourite the Colts were (which is true - they were 18-point favourites), most of the New York Jets genuinely felt bemused and angry at this. They believed the Oakland Raiders, who they had battled with 27-23 in the AFL Championship Game, were also a better team than the Colts. Aside from Namath's infamous "Guarantee", which he made while on the wrong side of sobriety while at the Miami Touchdown Club in the days before the game, he also stated as a matter of fact, that there were "five quarterbacks in the AFL who were better than (Earl) Morrall!" For the record, including himself, the five were Babe Parilli, Daryl Lamonica, John Hadl and Bob Griese. 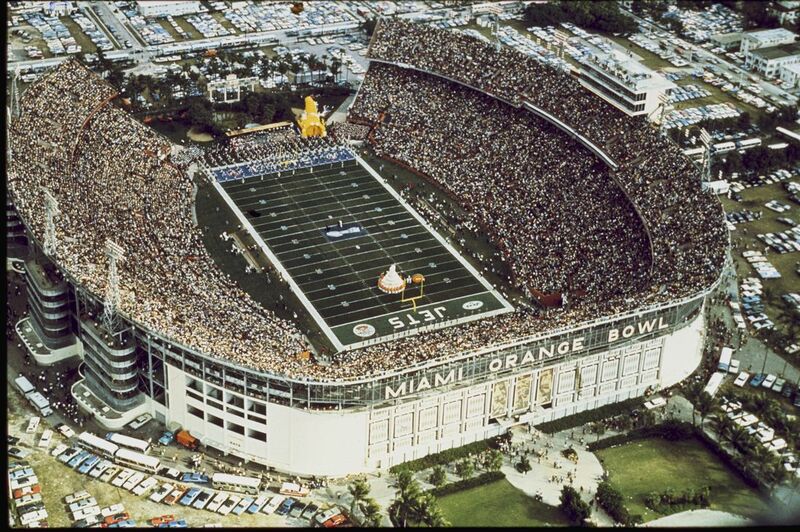 Perhaps bizarrely, due to the strict blackout rules of each league's respective television contracts, despite the Orange Bowl being sold out, the game was not shown live in the Miami area. 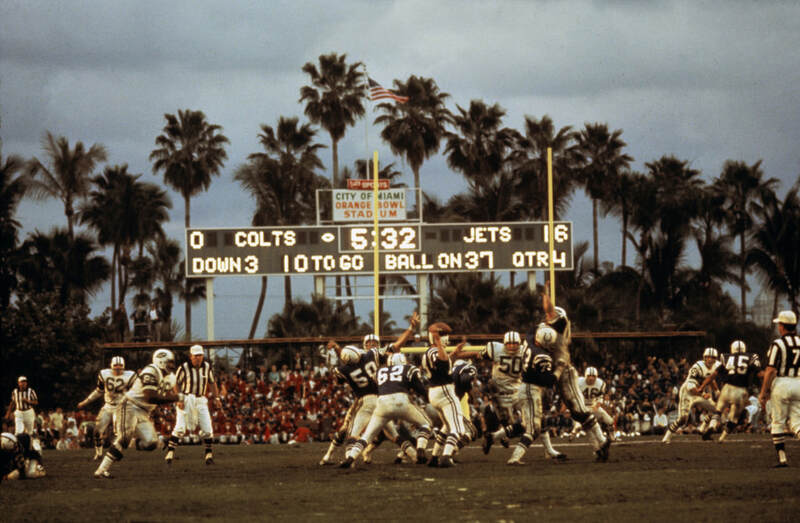 This resulted in many fans in Miami taking to their cars and driving to nearby towns not affected by the blackout so they could watch the game live. This temporary exodus of football fans to other bars and establishments undoubtedly cost local businesses somewhat. Super Bowl III was the first Super Bowl to feature, tentatively as it was, celebrities being involved with the opening ceremonies, when the Apollo Astronauts were honoured prior the national anthem with comedian, Bob Hope, leading the segment. After the AFL-NFL merger of 1970, the Baltimore Colts would move to the newly created AFC, in the Eastern Division along with the Jets. 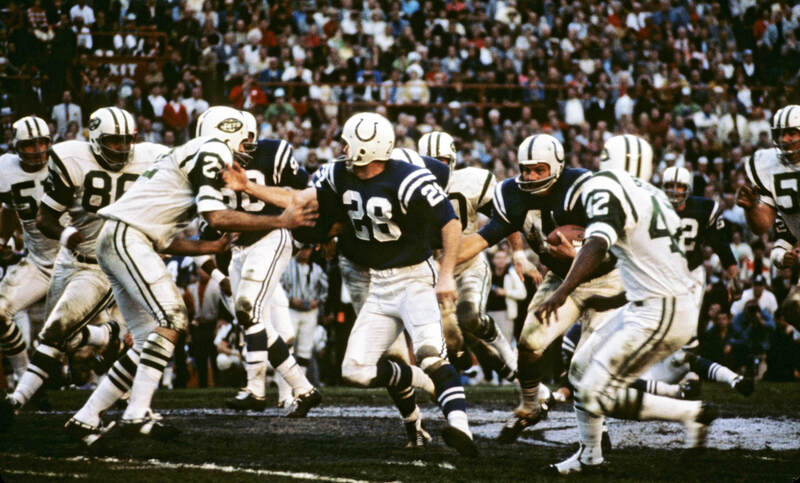 Although the move was more financial on the Colts ownership's part (they were well compensated for making the move), the rivalry that some thought would develop didn't do so, despite a regular season classic in 1972 that saw the Jets edge the Colts, 44-34, in a shootout in Memorial Stadium in Baltimore. ​As well as the interview with the aforementioned Smith, you can view an interview with Joie Namath on the Ed Sullivan Show in the days following the historic victory, as well as two short documentaries on just why Super Bowl III was so important. By the time Johnny Unitas entered the game for the Colts, the outcome was pretty much beyond doubt. On a muddy field in Tulane Stadium in New Orleans, the Kansas City Chiefs would net the AFL's second Super Bowl victory as they overpowered the favoured Minnesota Vikings, 23-7.